· Our focus is you. We will never encourage purchasing anything less than exactly what you’re looking for. · The best collections in the Midwest. We feature Justin Alexander, Kenneth Winston, Kitty Chen and Christina Wu. · We are a bridal boutique. We are entirely focused on the bride and bridal party! Not sure what to expect at your bridal appointment? 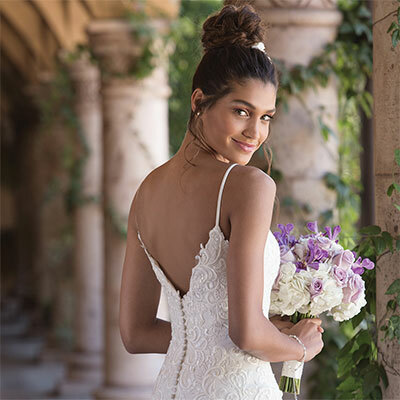 We offer a wide selection of appointment types ranging from wedding gown selection to our Premium Champagne Package, ensuring your experience fits just what you're looking for. Our Champagne Package includes Mimosas or a signature Champagne drink and coffee/soft drinks for you and your party, with an extended appointment time. Our store will be as comfortable as shopping for you and your wedding party from your own home. Appointments start at thirty minutes but can be as long as you'd like. Ready to get started? Schedule an appointment here. Have a question? Fill out your email below and we'll reach out to you as soon as we can. Monday: 12pm - 7pm Tuesday: Closed. Wednesday and Thursday: 11:30am - 6:30pm. Friday: 12pm-7pm Saturday: 10am - 4pm. Sunday: 12pm - 4pm.